Slithering Lizard is not a snake! The Sanskrit word for a snake is सर्प sarpa, from the verb root सृ sṛi, to slither. From sarpa we get the English word serpent. One of the defining qualities of a snake is its slithering, because of lack of any legs. In Sanskrit, all reptiles are called ‘slitherers’, सरीसृप sarī-sṛipa. But, just because it slithers a lizard or an iguana does not become fearsome like a snake. No one is scared of a lizard. Slithering is just one quality! A snake is not defined or dreaded by its slithering, but by its deadly poison and hiss. Without the power of the snake, just imitating its gait does not earn ‘respect’. One does not become great just by external appearance or position. One needs the qualities of power to be powerful. True leadership is not by position but by inherent qualities. Merely putting on a black power-suit would not give you the power. Bill Gates looks as powerful in his jeans and T-shirt as in any corporate suit, even after he leaves Microsoft. A variegated scalp does not make you Aamīr Khān of Hindi blockbuster Ghajani. 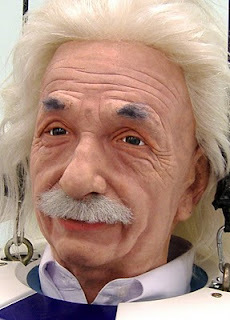 A quirky hairstyle does not make you Einstein or APJ Abdul Kalām, the former President of India and an eminent scientist. Wearing Niké does not make you Michael Jordan. Learn to develop the real qualities of the great, not just their external quirkiness. The wrapping only matters when the gift inside is already great in its own right. Develop real qualities; content over style. 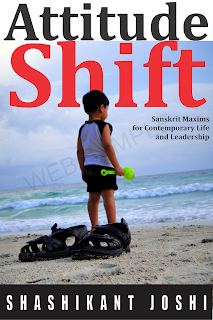 This post is an excerpt from the book Attitude Shift - Sanskrit Maxims for Contemporary Life and Leadership . You can download a FREE PDF file of the book by clicking the above link. Join the Facebook Page as well. godhā = kind of lizard, iguana. ahiḥ = snake, a dangerous large snake. 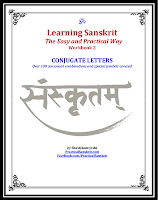 not to be confused with shrī श्री (śrī) which is erroneously written as sri without the diacritic marks. A lovely quote, and very well explained.Please go on!